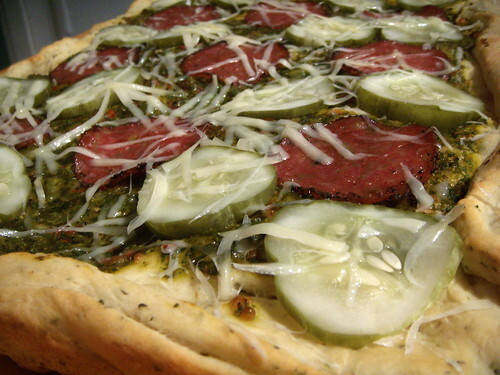 totally broke: peppered salami and pickle sicilian 'zah, originally uploaded by aarn! +21st July, 2008+. yeah, it sounds gross, but it was actually delicious! made some pizza dough with some yogurt and oregano, let prove once on it's own and then once in the baking sheet. topped the dough with a tapenade-like mixture of red onions, garlic, dill, parmesan flakes, and olive oil, and the peppered genoa salami. then after it was all baked up nice, added the large kosher pickle slices and topped with some shavings of parmesan.